As demand for PACS interoperability has increased, proprietary components have dwindled. This has led some in the industry to wonder whether PACS is becoming commoditized as image interoperability moves closer to becoming the industry standard. But the answer to that question depends on what the true value of PACS is. If storing and moving medical images is what makes PACS valuable, the systems will probably be commoditized. But Paul Chang, MD, FSIIM, a professor of radiology and vice chair of radiology informatics at the University of Chicago Medical Center, believes PACS’ value is demonstrated in a different way. Chang says the growing interest in cloud archives, thin-client workstations, and Web-accessible applications underscores the fact that none of these components represent the true value proposition of PACS. In his view, the use of these types of commoditized IT infrastructure demonstrates an ongoing maturation of PACS, which is good news. Commoditized components bring down the cost of producing PACS systems for vendors who, hopefully, pass some of those savings on to their customers. And a lower price point means that more facilities potentially have access to PACS. But this is only one aspect of PACS’ evolution; many issues remain unresolved. The workflow issue is the sticking point. Improved workflow is what everyone in the medical community—not just radiology departments—desires. The government desires it, too, hence the EMR meaningful use rules that were put in place last year. The problem, Chang says, is that the medical informatics field is 10 years behind informatics in other industries. For comparison, he cites the success of Amazon and Netflix in delivering an all-encompassing customer experience. Customers search the inventory and place an order, with reviews and other supporting information to aid their choice, and the desired product is delivered to their door. Completing these seemingly simple transactions requires seamless interoperability among credit card companies, warehouses, and shipping companies that, by and large, are handled correctly and promptly. To extend this analogy to radiology, moving images is only one step in the workflow process. While it is an important step, the radiologist needs to do more than just read the image to demonstrate value. However, Chang says one advantage of being 10 years behind other industries is that the medical community can learn lessons from how other industries solved these workflow problems. The question is how well those lessons have been learned. Chang believes most PACS vendors willingly adhere to an unnecessarily narrow definition of interoperability because moving images is easier than interfacing with nonimaging systems. But he says radiologists must insist on those interfaces or they risk being commoditized themselves. He cites the ability to obtain lab results, pathology reports, and medical histories as important features that can significantly enhance radiology’s value. To do that, the radiology community will need to embrace a more encompassing vision of interoperability. “I actually believe we need much more mature, much more capable interoperability integration because then it gives me a better tool so that I can go beyond just demonstrating commodity-level service, just reading the film, but I can extend that to really improve the quality and the value I provide to my patients and my referring physicians,” says Chang. 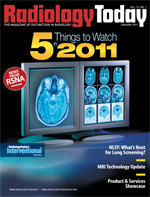 Going forward, Chang says comprehensive interoperability will be essential for radiologists. Without better tools, he warns, they will find it increasingly difficult to demonstrate value, and that will erode any competitive edge that they now possess.